Between April 28 and 29, 2015 a solar flare produced a filament that spread to a really huge distance. The result is that the images of the space probe SOHO (Solar and Heliospheric Observatory) that captured the filament, to include it cover a wide area of ​​45 million kilometers (about 30 million miles). Solar filaments are are a common phenomenon but usually don’t reach such large sizes. They’re plasma jets that from the layer of the Sun’s atmosphere called the chromosphere extend toward space, pushed by the solar magnetic field. They’re also called solar prominences. Normally they extend for thousands of kilometers. The SOHO spacecraft operates in a mission in collaboration between NASA and ESA which has the main purpose to study the Sun. Its original mission had a duration of two years but it’s been going on for almost 19 and a half years. Among the coronagraphs in the suite of SOHO’s instruments there are the two LASCOs (Large Angle and Spectrometric Coronagraph) that were used to take photographs of the huge solar filament appeared in late April. The coronagraphs take images of the solar corona by blocking the direct light that comes from the Sun with a concealment disk. It creates a kind of artificial eclipse within the instrument itself. 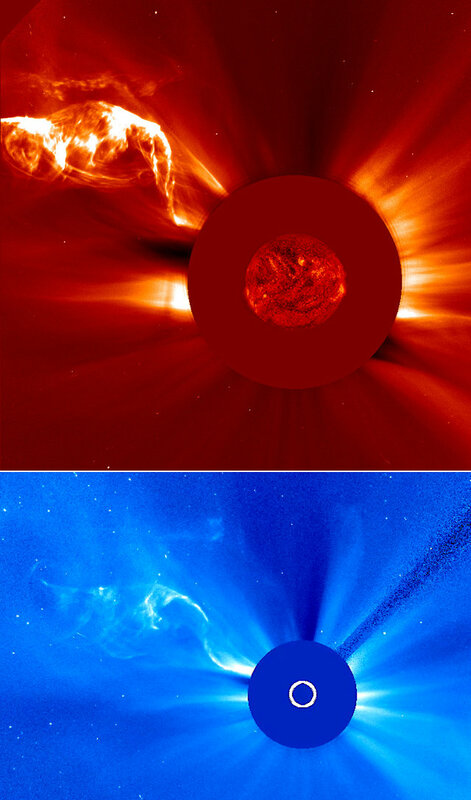 The top image was taken by the LASCO C2 coronagraph and shows the inner solar corona up to 8.4 million kilometers (5,25 million miles) from the Sun. The bottom image was taken by the LASCO C3 coronagraph with a wider field of vision for a width of 45 million kilometers (about 30 million miles). The images of this huge filament and of the coronal mass ejection associated with this solar eruption are really impressive. They remind us that the Sun can emit huge amount of gas at very high temperatures and consequently high energy particles. The research on solar phenomena have the purpose of understanding the mechanisms that generate them. Their consequences can be felt even on Earth, in severe cases with problems for the satellites in orbit and even for electrical equipment and power grids on the ground. In this case, luckily we can enjoy a show that is literaly stellar!